Though not uncommon for rock climbers to start in predawn darkness, one was about to challenge his sensorial awareness beyond the norm. Holy crap that was fantastic! I was did not see that coming. I guess he would not see it coming either.. Heheh. Any man I really really liked this. 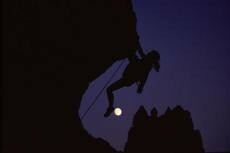 I've always liked the Idea of mountain climbing but my extreme fear of heights always kept me from doing it. Are you F&#$ing testing me?